This Salmon Patty Recipe makes the Best Salmon Patties. 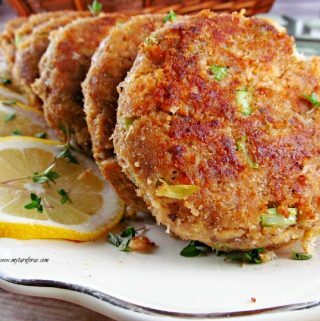 It’s a simple recipe that uses canned salmon And the salmon patties are breaded and fried in butter which makes them above delicious. Salmon patties are a staple in the South that I grew up in. My mom would make the best salmons patties and I love them. I didn’t realize then of the health benefits of fish, that was the last thing on my mind. Two of these patties contain more calcium than a glass of milk. 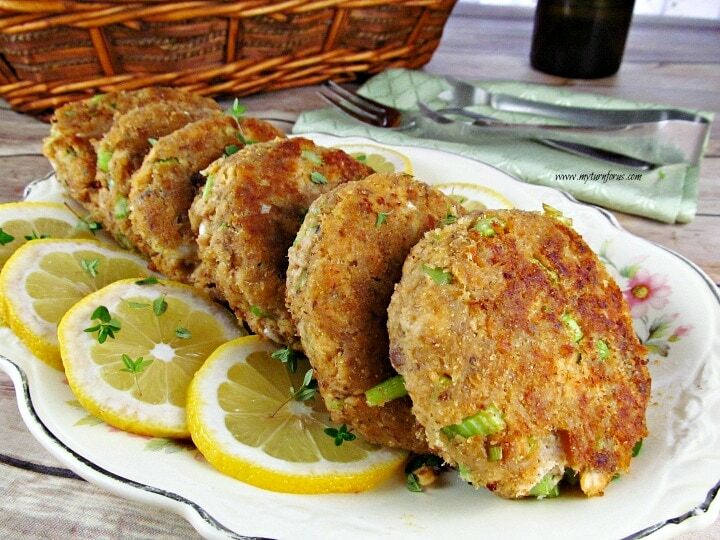 And if these salmon patties are served with wild and brown rice and steamed vegetables, it makes them a very healthy meal. And this salmon patty recipe is a great go-to dinner when you have forgotten to thaw meat out that you have in your freezer. We try to keep a couple of cans of pink salmon in the pantry for this awesome dish. We start this Salmon Patty Recipe by opening a couple cans of salmon and removing the skin pieces and most of the bones. I know everyone tells me that the bones are cooked and can be crushed in the patty but I usually pull most of them out. 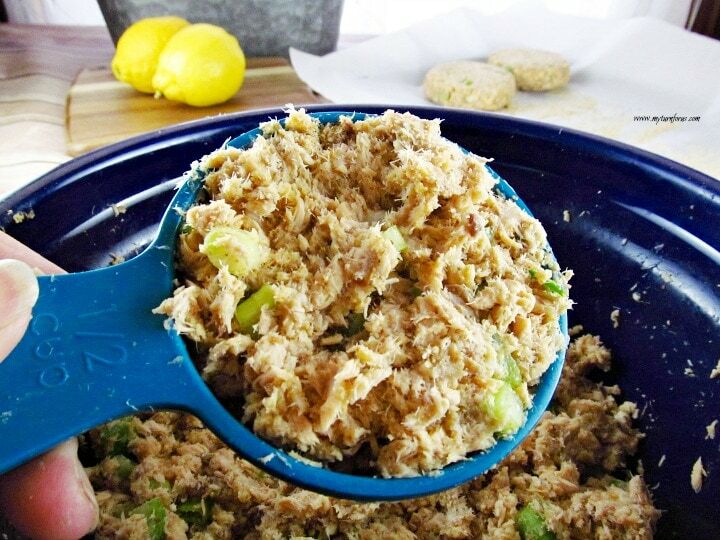 In a large bowl combine the salmon, eggs, 1 cup of the bread crumbs, onions, celery, lemon juice, salt, and pepper. Scoop up 1/2 cup of the mixture and form into patties. Place each salmon patty on a parchment lined sheet pan that is sprinkled with breadcrumbs. Place the patty down and then turn them to coat both sides with the breadcrumbs. 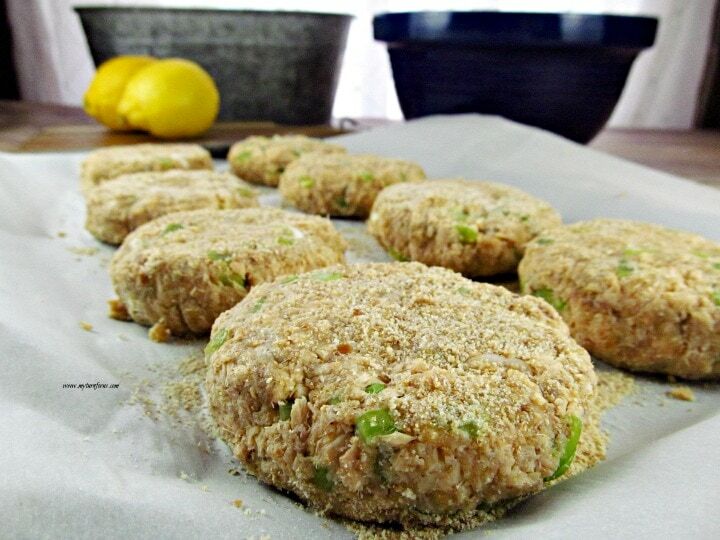 This salmon patty recipe will make 8 patties. Heat the butter in a large skillet and fry 4 patties at a time until golden brown. Serve garnished with lemon slices or wedges and sprinkles parsley or thyme. Open the cans of salmon and remove the skins and most of the bones and drain off the juice. In a large skillet over medium-high heat cook 4 of the patties in 2 tablespoons butter or olive oil for 8-10 minutes until golden brown, turning once. Looks delicious and healthy, Evelyn 🙂 Pinned to make soon ! These patties look awesome. I haven't had one in years. My mother used to fry these in her iron skillet and they were just tremendous. I've got to make some now. I love salmon patties, thanks for linking these up at The Southern Special. 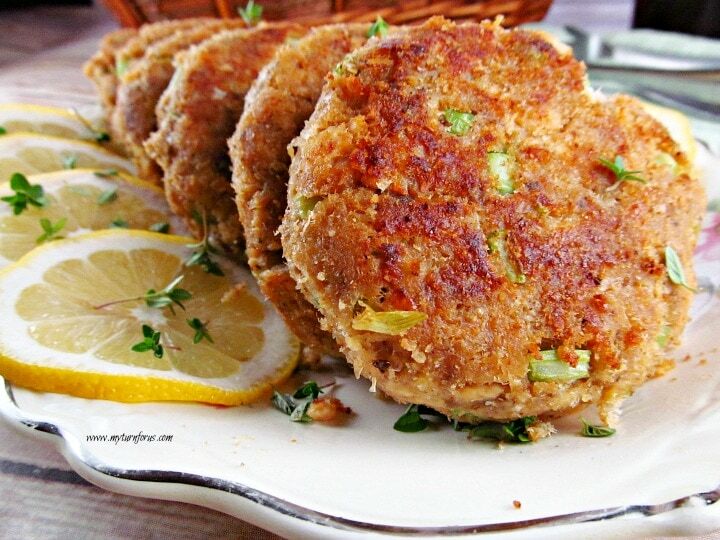 My hubs makes salmon patties (a family fav), recipe is slightly different. He doesn't put celery or onions in his…but I think he should. These look delicious! Thanks so much for sharing with us at Simple Supper Tuesday. Have you grilled these? Mine aren't quite thick enough to hold together on the grill, but I think that would be SO good! Can you believe that considering all the seafood we eat, I've never had salmon patties…or any fish patties for that matter. They look so light and fresh with the lemon juice and celery. Do you think you could freeze these ahead of time and cook later? I have loved salmon patties all my life. I make them just a little differently. Instead of scallion I grate about 1/2 large onion and a carrot into the mixture and add in about 1/2 fresh copped parsley. I alternate using matzoh meal or cracker meal instead of bread crumbs. That sounds delicious also. We will have to try it! I have just got to add one thing to your delicious sounding recipe that will make them even better. I learned this from growing up on salmon patties also. When you open the cake, drain off the oil (or water) into a small bowl. Stir in 1 T. of baking powder with a fork andlet it set till you get everything mixed together. Before you roll them into patties, pour in your mixture and mix well. Then proceed as usual. I have found that this makes them crispy (even without the bread crumbs). Made these last night, they were very good. I had to use panko, and maybe that made me have to add some extra water so they would hold together. But the panko made the outsides extra crunchy along with the celery. I made a fast aioli to go along with them. And still good and fairly crunchy the next day! Thanks very much! Thanks so much for letting us know. Love the idea of aioli to go with them. We must try it also!